Free Parking & Trolley Service! The 2019 International Greek Food Festival is looking forward to continuing the tradition of serving FOOD, FRIENDS and the COMMUNITY! Our Festival begins on Friday, May 17 from 11:00am to 9:00pm, continues on Saturday, May 18 from 11:00am to 9:00pm, and wraps up on Sunday, May 19 from 11:00am to 3:00pm. Over the past 34 years, the Festival has donated nearly $1.5 million to more than 30 outstanding local charities. Scroll down to our Charities section to see the worthy organizations. $3 entrance fee (or three canned food items). Parking, trolley service, and children under 12 are FREE. 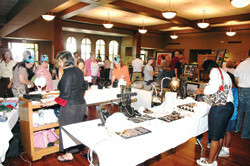 As always, guests will enjoy a vast array of food, cultural performances, shopping, and children’s activities. This year’s entertainment lineup will be better than ever! Come and join us – rain or shine! OPA!!! The International Greek Food Festival, the largest ethnic festival in Arkansas, has been serving food, friends and the community for the past 33 years. All the food served at this festival has come about because of our great love of cooking and good food. The wonderful cuisine associated with the many cultures that make up the Annunciation Greek Orthodox Church is the product of our immigrant forefathers. We boast a long line of cooks from various culinary traditions, making up the best of our Church’s culture – Greek, Armenian, Georgian, Romanian, Russian, Indian, Middle Eastern, English and a dash of American. From these cultures has evolved this distinctive collection of foods identified with the Greek Orthodox Church – a style of cooking that not only captures the traditions of our heritage but makes eager eaters call for more. Calamari is a dish in Mediterranean cuisine. It consists of batter-coated, deep fried squid, fried for less than two minutes to prevent toughness. It is served plain, with salt and lemon on the side. Lukániko is the common Greek word for pork sausage, but in English it refers specifically to Greek sausages flavored with orange peel, fennel seed, and various other dried herbs and seeds, and sometimes smoked over aromatic woods. Sidewinder-cut potato wedges covered in feta and Mediterranean herbs, topped off with a dash of lemon juice. More than 40 layers of filo dough brushed with butter and layered with nuts and spices, then drizzled with honey syrup. A spice, nut and filo-rolled pastry resembling a hollow log, which is lightly dipped in honey syrup. Delicate, buttery almond powdered sugar cookies. Spice cookies dipped in honey syrup. Buttery shortbread cookie with strawberry filling and a lattice top. Fried dough balls doused in honey and powdered with cinnamon and honey. Rolled pastry made with shredded filo, nuts, orange and brandy. Drizzled with our famous baklava syrup. Blend of lamb, beef and seasonings seared and stuffed in a pita, topped with diced tomatoes, onions and tzatziki sauce (a savory yogurt sauce with garlic and cucumbers). Thick and tangy chick pea dip, served with pita bread. Tossed cracked wheat and parsley salad. Spicy fried patties of ground chickpeas served in a flat “wrap” with diced tomato, onions and lemony tahinneh (pronounced “tah-HEE-ney”) sauce, a tasty sesame-based dressing. Tender chicken tenderloin marinated in olive oil and a blend of Greek seasonings, grilled to mouthwatering perfection, and served on a skewer with a slice of pita bread. Tender pork tenderloin marinated in olive oil and a blend of Greek seasonings, grilled to mouthwatering perfection, and served on a skewer with a slice of pita bread. Grilled chicken seasoned, seared and stuffed in a pita, topped with diced tomatoes, onions and tzatziki sauce (a savory yogurt sauce with garlic and cucumbers). Long macaroni layered with seasoned ground beef, topped with a thick cheese “Beschamel” sauce. Delicate filo dough brushed with butter and layered with a filling of feta cheese, spinach and herbs. Two large pieces of spanakopita and a Greek salad. Lettuce, feta cheese and Greek olives tossed with Pete’s Famous Salad Dressing, a vinegar-and-oil based dressing, and served with pita bread. Greek meat balls in tomato wine sauce. Generous portions of pastitsio, spanakopita, and Greek chicken, served with Greek salad, make this delicious platter worthy of its name. A 1/3 lb. patty of flavorful ground lamb meat seasoned with Greek spices and topped with tzatziki sauce, feta cheese and lettuce, all served on a fresh Arkansas gourmet bun. Vanilla ice cream topped with baklava sprinkles. Chicken smothered in spices and lemon juice, baked ‘til it’s tender and juicy, and served with rice, Greek salad and Pita bread. Lettuce, feta cheese, and Greek olives tossed with Pete’s Famous Salad Dressing, a vinegar-and-olive based dressing, and served with pita. 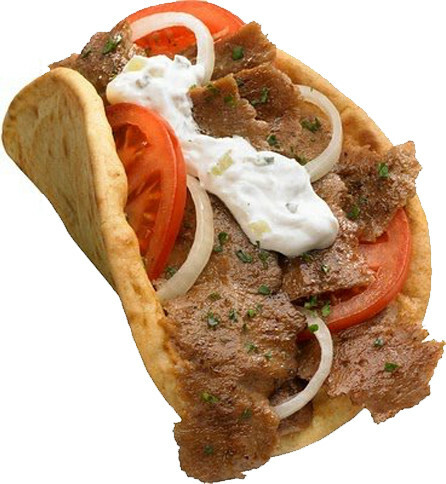 Blend of lamb, beef and seasonings seared and stuffed in a pita topped with diced tomatoes, onions and tzatziki. Served with a Greek Salad. Grilled chicken seasoned, seared and stuffed in a pita, topped with diced tomatoes, onions and Tzatziki sauce. Served with Greek Salad. Blend of lamb, beef and seasonings, seared and stuffed in a pita topped with diced tomatoes, onions and tzatziki, a savory yogurt sauce loaded with garlic and cucumbers. Tender chicken marinated in olive oil and a blend of Greek seasonings, grilled to mouth watering perfection, and served on a skewer with a slice of pita bread. 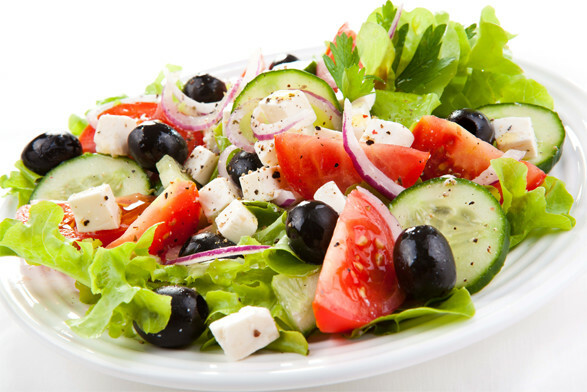 Lettuce, feta cheese and Greek olives tossed with Pete’s Famous Salad Dressing, a vinegar-and-oil based dressing. Made and bottled right here in the Annunciation kitchen by our very own Pete Vratsinas and his crew. We use only the finest ingredients and spices. A delicious dip made from mashed chickpeas, blended with tahini, lemon juice, salt and garlic. Served with our delicious pita bread. Four pieces of pastry: Baklava, sourota, kourambiethes and a Melomacarona. This year the Festival is featuring our scrumptious medley of Greek and Mediterranean menu favorites, including BAKLAVA, gyros, calamari, pastitso, sourota, Armenian pizza, soutzoukakia (Greek meatballs) and much more. All of this mouthwatering cuisine can be enjoyed at the Festival or picked up at the drive thru. The Festival will again feature our popular Old World Market, offering specialty foods such as falafel, Greek olive oil, hummus, dolmathes (stuffed grape leaves), cheeses and the popular Pete’s Famous Salad Dressing that is handmade and bottled at the parish. 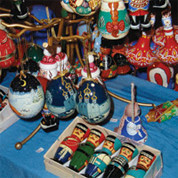 Pastries and an array of imported gift items from around the Mediterranean will also be available in the Market. As in years past, one of the most wonderful parts of the International Greek Food Festival is YOU, our friends!. When you visit the Festival with your family and friends, a good time is guaranteed. In addition, you can make new friends at the Festival by enjoying a wide array of international entertainment while reveling in all of the food & shopping available. You can even learn more about your neighbors by taking a tour of the Annunciatioin Church and discover the rich history and tradition of the Orthodox Christian faint as well as enjoy the largest collection of Byzantine iconography in Arkansas! Be sure to stop by our amazing indoor Old World Market to browse through many unique and exceptional items carefully selected and imported from around the world. You’re certain to discover something wonderful that will help you remember your trip to our festival for many years to come! Icons, books, gifts and artwork. Take home a taste of all the great foods you’ve found at the Greek Food Festival by stopping at the Grocery. You’ll find practically everything you’ll need to create your own authentic Greek meals. Shop for a variety of specialty foods, including imported Greek olive oil, filo, Greek olives, cheeses, appetizers and that popular Pete’s Famous Salad Dressing, home-made and bottled on the church grounds. For the gourmet, there’s an assortment of pastas, dried herbs, spices, Greek coffee, grape leaves, tahinneh sauce and capers. The grocery also will carry pasteli (sesame candy), halvah (honey sesame paste), imported cookies, and dolmathes (stuffed grape leaves). Sample our sweet confections right on the spot or take home a variety, all lovingly prepared by our very own church members based on time-honored recipes. You might want to take a break from all the festivities by visiting the church which will be open to the public throughout the weekend, with guided tours to be conducted by the Rev. Dr. Nicholas Verdaris. 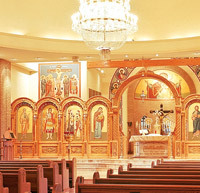 You’ll have an exceptional opportunity to learn about the history and traditions of the Orthodox Christian faith and view the exceptional iconography and hand-carved icon screen spanning the width of the altar. We are delighted to have you join us at the International Greek Food Festival of the Annunciation Greek Orthodox Church. We hope that you will not only experience the exciting food, festivities and culture, but will take a moment to learn about our faith. If you’ve never been to an Orthodox Christian Church before, we encourage you to participate in one of our guided tours to be conducted by our very own Rev. Dr. Nicholas Verdaris. But first, here are some things that will help you understand our church and our Christian faith. Do you know that there are 250 million Orthodox Christians worldwide with more than five million right here in the United States? It is the second largest denomination in all Christendom. Despite its size, relatively few Americans are aware of the Orthodox Church. It’s America’s best-kept secret. Our church aptly refects America and is made up of men and women from around the globe all witnessing to the Good News of Christ. The Annunciation is a vibrant parish that adheres to Orthodox Christian principles which are concurrently Scriptural, Traditional, Apostolic and Eucharistic. Though you can learn a lot about Orthodox Christianity by hearing it described, it really must be seen and experienced firsthand to be fully understood. And there is perhaps no better place to see and experience the heart of Orthodoxy than in its worship. Let’s look at a few characteristics of Orthodox worship which may be different from any of your past experiences. The main Sunday morning worship service of the Orthodox Church is called the Divine Liturgy. The term Liturgy means “work of the people.” Participation is the key word here. The whole congregation is active in worship, even the children. The Divine Liturgy is the common act of prayer, worship, teaching and communication of all those who constitute the Church. In the Liturgy all are invited to participate, by grace, in the life of Christ. It is through worship and service that we thereby come to know Christ, the source of our hope. What happened almost 2000 years ago becomes vital, alive and contemporary to us in the Divine Liturgy. Since the times of the New Testament, Christians have believed that when worshiping God, we who are earthbound enter by the spirit into “heavenly places.” In Orthodox worship, we can step out of the pandemonium of time into the peace of eternity. Therefore, everything in our worship has heaven as its point of reference. But this heavenly focus by no means turns worship into a mental religion. In the Orthodox Church, a human being coming before God involves the unity of soul and body. Accordingly, worship calls for the action not only of the mind, the emotions and the will, but also of the body with all its senses. So, as the Scriptures describe, in worship there are things to see, hear, touch, taste and smell. Our whole being is to participate actively in the worship of God. We hope you enjoyed this brief glimpse into the Orthodox Church. For more detailed information, please visit the Annunciation Greek Orthodox Church’s website or simply visit us on any given Sunday at 10:00am to behold a dynamic 2000-year-old tradition come alive at the Annunciation in Little Rock. The Easterseals will set up a mountain of fun, like frame making and face painting. And we know how finicky kids can be about what they’ll eat, so we’ll be serving grilled hot dogs. Plus this year we’ve added even more fun attractions, including some super-fun rides and games. Big Brothers Big Sisters provides children facing adversity with strong and enduring, professionally supported 1-to-1 relationships that change their lives for the better, forever. The organization partners with parents, guardians, volunteers and others in the community and holds themselves accountable for each child in the program to achieve higher aspirations, greater confidence, improved educational success and better relationships with the avoidance of risky behaviors. 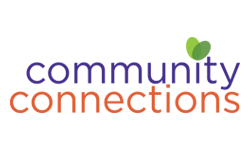 Community Connections is dedicated to providing quality extracurricular activities for children with special needs as well as support for their families. Programs offered include football, soccer, art, music, theatre, cheerleading, basketball, tennis, golf and martial arts. An Autism Resource Center is also available to offer education and support to individuals with ASD and their families. Programs are offered free of charge and are located in Russellville, Conway and Little Rock. Easterseals Arkansas is a nonprofit health and human services agency dedicated to helping children and adults with disabilities and special needs achieve greater independence and improved lives. Easterseals provides services across the state to meet the varying needs of people with disabilities and their families. These comprehensive services provide a continuum of care from birth to aging adults and focus on the family as a whole. The HSPC is central Arkansas' largest and oldest no-kill shelter in Pulaski County, Arkansas. The mission of HSPC is to rescue, rehabilitate, provide veterinary care, spay/neuter, and find loving homes for Central Arkansas dogs and cats in need. Since 1980 Ronald McDonald House Charities of Arkansas has provided a "home-away-from-home" for more than 35,000 families whose child has been sent to Little Rock for life-saving medical care. When a family struggles with their child's critical medical condition, the House provides a private place for them to stay each night and the little things that are otherwise easily taken for granted. Our second core program is The Ronald McDonald Care Mobile, a full-service 40-foot mobile dental office. The Care Mobile provides comprehensive dental care and education, free of charge, to low-income children in six Central Arkansas counties. The Wolfe Street Foundation is Arkansas' largest nonprofit resource dedicated to recovery from alcoholism and addiction. Since 1982, it has provided facilities for groups faithful to the original 12 Steps. The foundation also develops and implements a variety of programs aimed toward education and prevention for youth, families and individuals trying to recover from alcoholism and addiction. The doors to its center in downtown Little Rock are open 365 days a year, 16 hours a day. 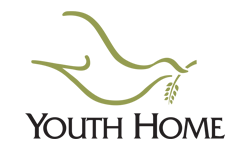 Youth Home is one of the largest and most experienced nonprofit mental health providers in Arkansas. Its mission is to equip and empower youth, adults and families to become healthier contributing members of the community by providing compassionate emotional and behavioral health care. Mental illness is illness like diabetes or cancer, and Youth Home is committed to ending the stigma that keeps people from seeking help when they need it. Arkansas Foodbank, the largest food bank in Arkansas, is a member of Feeding America and the Arkansas Hunger Relief Alliance. Its recent merger with the Arkansas Rice Depot creates new and innovative programming focused on serving hungry Arkansans with more healthy and nutritious food. Programs like Food For Kids, Food For Families, and Food For Seniors provide food and other resources for more than 450 food pantries, soup kitchens, schools, colleges, shelters, senior centers, and other agencies that provide aid directly to hungry Arkansans. Brown, Rogers & Company, P.A. 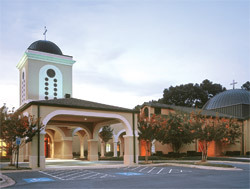 Free parking is available across the street at Agape Church, 701 Napa Valley Drive. Park and Ride the Trolley FREE! Take advantage of two trolleys running every 10 minutes from Asbury United Methodist Church, 1700 Napa Valley Drive, and Pulaski Academy, 12601 Hinson Road.